Ray, that knife is a thing of beauty. You are a lucky man. What's the handle? That is one sweet knife there. I THINK I remember Knifey saying Gaboon Ebony? Yessir, some of these pictures look familiar. Knifey, Sir, you do beautiful work with them rocks. I know you had a wonderful time with Ray at his place. Ray, you make sure and show us the game you harvest with them arra's. WOW!!!! Woody has talent coming out of his ears. Those are some of the most beautiful points and blade I have ever seen. Absoulutely awesome work Woody!!! You are dang handy with that camera too. Nice photo's. Looking forward to more of the same, but maybe with a pig kill story too. That knife had a macassar ebony handle. Nice stuff to work with and gorgeous, too! We met about noon and within thirty minutes I felt like Ray and I had been best friends for years. Ray, pardon me if I embarass you, but folks, this is one of the greatest guys you'll ever hope to meet. Forget hog hunting, forget depth of knowledge, just take the opportunity to get to know him. And be sure to ask him to sing. Terry knows what I'm talking about. We cruised through some likely hangouts for hogs and tossed some corn in shallow water around wallows. We'd barely driven out of one area when a black Volkswagen sedan crossed the road behind us. Turned out it wasn't a VW, but a nice big hog already snarfing down corn between blackberry-eating binges. Most of the hogs on this property are direct descendants of stock brought over by Spaniards hundreds of years ago. They are black as sin and their ears are erect and pointed. There are a few other feral hogs here, but the landowner encourages hunters to remove them to keep the Spanish strain as pure as possible. We fine-tuned our gear and chatted until it was time to get in the woods. Except for one quick whitetail hunt in Idaho, it's been ten years since I've done any kind of hunting. And it's been over twenty since I had a bow in the woods. I've tried to explain to my wife how much I missed hunting, but only another hunter can understand the bone-deep longing. Now, finally, the time had arrived. The first stop was the dark bottom land. There was hog sign, but no hogs. Plenty of armadillos but no pork. A couple of barred owls moved ahead of us through the big timber. Ray said, "The hunters are out." I was glad to be one of them. We got back to the truck and decided to check some of the wallows we'd corned. Nothing happening yet -- probably too early, but with time to spare, Ray suggested I cruise through a section of young pines. There were blackberry thickets in there and hogs might be up and feeding on them. He was right. After several hundred yards, I heard hogs grunting. The wind was good, so I moved in. A thick blackberry bramble stood between us, but the hogs were less than eight yards away. I could hear their lips smacking as they ate, but I could only get glimpses of hide. Maddening. What was I looking at? Which direction are they facing? Then they started moving. I got a quick look -- good hog. Another couple feet and it'd be in an open spot under pine limbs. The bow came up and the arrow was away. Pine limbs. That tree! My flint-tipped arrow deflected over the hog's back and the little herd scattered. I was angry and exultant at the same time. I never saw that arrow or those hogs again, but that was okay. I was hunting. I met Ray on the far side of the pines. We talked about the encounter and then he quietly mentioned that he had a pig down. Ray, don't let me steal your thunder, buddy! This is a good story about second-chance shots and Grizzlies! Another great hunt with Ray... Gotta love it. Knife river, funny you mentioned the singing part I was wondering last eveing if you got to hear that wonderful voice of "Rapper Ray". Ahhh yes....very nice pics there Woody....and as the others said, your talent is simply stunning. You are correct, you'll not meet a nicer guy than Ray. Tell your first tale Ray....and don't you think it's bout time for a "smoke off" with all that pork you got? Mostly I was just hoping Woody would get into them in the berries, as most of the droppings we had found, even predator droppings, were just filled with blackberries! I check the wind constantly in that flat country as it regularly changes, using a puffer bottle loaded with corn starch..and just walk against or cross-wind as the circumstances offer, and try to be as quiet as possible when moving along. We put the corn we use- (about 3 sacks is plenty for a 4 day hunt)and we do it IN the water OFF the roads, so we can use the roadways to move in and the hogs are working IN water to try to get the corn- keeps them busy, and noisy, and gives you a chance to move in undetected. Funny thing though, we usually take NO hogs ON the corn...but this hunt was different. As I moved along the road at the other end of the block Woody was going through I heard that unmistakable sound of a hog working a wet area- its a combination of jaws grinding corn and nose pushing water around...once you hear it you always remember the sound. The hog was head down-facing me- workin' it! I loaded up one of the beautiful flint river broadhead tipped arrows Woody had made up and got ready. She jumped sideways, flipped directions- and stood perfectly quiet- checking with all her senses for ANY signal of what just happened. That's the great thing about a quiet bow- you sometimes get a second chance. I stood stock still and waited, and presently she put her nose down, I loaded up and started my draw- but it was too much movement- she picked up on it and started off...but one thing about my Centaur is I know it hits with the heavy arrows I use with a tremendous amount of authority so I shot her going away, through the side of the ham and the arrow went in to the nock, the Grizzly cutting everything important because she traveled less than 20 yards- close enough for me to still see her, and expired. This is too good! :D Enjoy this very much, keep it com'in guys. Man those stone points are something else. Hmmm..wonder how many hours from St. Louis to Ray's?? Well, I've done it twice now... Wrote a lot, went to Photobucket to grab a photo, and returned here to see everything I'd written has disappeared. Yep, I just love computers and all the minor frustration they bring. That's why I enjoyed making a couple points out of the glass from a computer monitor. Low-grade revenge. The glass was great stuff, though: it seemed to be denser than most glass. I hoped that would translate to durability for hunting. The second afternoon we headed toward a crossroad which seemed to be a the center for a lot of hog sign. Just as we rounded a bend, we could see a big one in the road. And it was was working our way! I hopped out of the truck and half-sprinted through the woods to close the distance. I took cover in tall broomstraw on the side of the road, nocked a 125 grain glass-tipped arrow and waited. And waited. Christmas came and went and the hog didn't show. Behind me, a couple little porkers trotted out into the road and were soon joined by almost a dozen more. They were only a hundred yards out and I hoped they didn't come my way. The last time I'd seen the big guy, he was only 40 or 50 yards out. Then two whitetails popped out of some pines over my left shoulder. They pegged me and blew and stomped to prove it. After they finally moved on, I decided to check on the big guy. The wind was in my favor and three careful steps into the road showed that he was gone. I could see Ray off in the distance and joined him. He was almost beside himself that I hadn't shot the big hog -- he thought it had been standing broadside to me in the road at less than 15 yards. I wish! Ray's binoculars had compressed the distance and made it look like the hog was nearly in my lap. I don't think it ever got closer than 40 yards. The sow suddenly popped into the road and gave me a big hairy eyeball. She bailed out with a big grunt and the three piglets. There were still more pigs in the wallows past her, though. Another five minutes to cover the next ten yards gave me a view of two nice pigs working the mud. 35 yards is too far for me, so I tried to close the distance. One of them saw or smelled something and left the wallow for thick cover. The other hesitated a few seconds but then followed. But there was a third hog still slurping behind some tall marsh grass! I closed the distance while I was screened. The hog stepped out broadside and spotted me, but my bow was already up and the arrow was in the air. I love to watch arrows fly and this one was a thing of beauty. The white nock traced a perfect arc to where the hog was just starting to turn away. I wasn't sure if I hit it, though -- that hog was moving fast and I figured the distance to be about 28 yards. 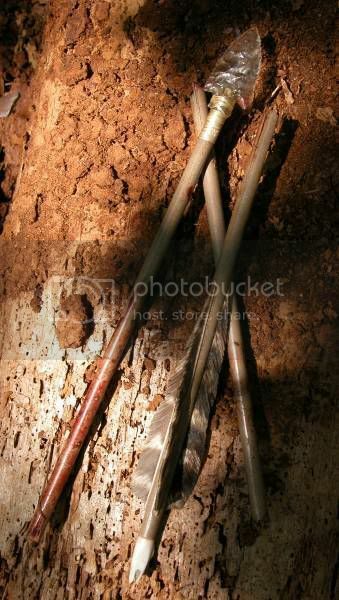 I started looking for my arrow but couldn't find it. Not surprising in all the mud and grass. Then came the sharp, dry snap of a breaking cedar shaft! Maybe I'd better look for blood. Three yards into the thicket, it looked as though the ground had been painted. It continued down a well-used trail, but after 30 yards it disappeared. No blood. I backed up to the last sign and heard lots of flies buzzing in the thicket. On my hands and knees I peered into a black hole under the bushes and saw the hog on its side. I poked it with my Blacktail's limbtip to make sure it was finished before I reached in and pulled it out. The fletched end of my arrow was laying with it. Another 2/3 of my arrow was around somewhere and I'd like to find it. Back in the skinning shed we found the middle third of the cedar shaft still inside the hog. The little glass point had done its job well. The arrow had traveled diagonally through the 90 pounder, entering almost dead center on the body and exiting low on the opposite front shoulder, slicing vitals on the way. Most interesting was that it had cut one rib and completely severed another as it exited. I really wanted to find the point now to see how it had been damaged. The next day I was back at the kill site. I followed the pig's trail all the way back to the death bed. Far under the brambles I could see the arrow point! I pulled it out and looked it over -- if there was any damage it was on a scale too small for the naked eye. It looked and felt sharp, ready for a new shaft, but I wanted to save it just as it was. Would you believe that it's easy to mistake a hummingbird for a hog? It happened to me a dozen times. Rubythroats were abundant, probing red trumpet flowers for nectar, snatching gnats out of the air, and sifting through the ends of pine boughs for bugs. When they made an abrubt change in direction, the "thrum" of their wings sounded amazingly similar to a hog grunt. There seemed to be a distinct lack of hogs 15 feet in the air, so I gradually learned to sort them out. Hummers near the ground, though, always doubled my heart rate and brought an arrow to the string. The next afternoon the wind wasn't cooperating for the wallows we intended to hunt. We hoped the wind would shift as the sun went behind the big yellow pines, so to kill time, we walked down an overgrown road. Turkeys flew up to roost and armadillos snuffled through leaves. One 'dillo wobbled up to less than a yard from me. My thought was to try to tip him over with the toe of my boot -- not punt the little guy, but just see how he reacted, if I could even tip him over. At about two feet, he finally winded me (or heard me laughing) and ran away to safety -- all of about five feet away. Then Ray judged that the wind was better and the hunt was on. And almost as quick, it was over. The first wallow, wide and shallow, backed by Virginia creepers and blackberries, held about four pigs, all about the same size. Ray motioned me on and I stayed low behind tall sedge as I closed the distance. I raised slowly, chose the closest one, and let an arrow fly. The flint-tipped arrow closed the 13 yards fast and the pig disappeared behind the vines. Ray joined me and said he'd heard the pig die, so I went to to retrieve it less than ten yards from where it was shot. I picked up the arrow (a pass-through) and except for the mud, it looked perfect. I met Ray back on the road: another pig was rooting 25 yards away in another wallow. Ray nocked an arrow and ghosted down the road. In less than a minute, that pig was also ready for a trip to the skinning shed. The skinning shed deserves a better name. It's a first-class operation, with running water, cement floors, screened work area, two electric hoists, metal tables, and a walk-in cooler set to 37 degrees. After several days in the heat, I tended to linger in the cooler "admiring" the hogs. One afternoon I made a six or seven inch corner tang knife from a piece of raw Texas chert known as "amoeba." One theory about them is that they weren't hafted, but put on a short thong around the wrist. We butchered the first hog using steel knives, both of us grousing about how fast our knives lost their edge. I decided to give some flint flakes and the corner tang a try. The flint flakes, although pretty good sized and ridicoulously sharp, were a bit hard to hold. The corner tang was nothing short of amazing. After dulling the back edge so I wouldn't cut my fingers off, the stone blade slid through the heavy hogs' hides like butter. The trick was not applying too much pressure and cutting too deep. I also avoided bones as the flint is brittle, but for skinning and filleting, it worked better than anything Ray or I have ever experienced. I really liked the wrist thong, too. Whenever I needed to pull hide or shift the carcass, I just dropped the knife. A gentle flick brought it back to my hand. After three hogs, it seemed as sharp as when we started. I saw one small nick in the edge which I think I caused by accident. You are an artist without a doubt. Sounds like you and Ray had a blast and came out of it with some real good eating to boot. Man, you guys sho nuff got the grillin fixins now! Great story guys...and thanks for so many high quality pics. You've got me promising myself I'm gonna take more/better next outing.